In honor of World Elephant Day I decided to pull some snaps out the “Tanzania, 2007” photo shoebox. What I dug up includes a handful of elephant and “Big 5” wildlife photos from a day safari to Ngorongoro Crater outside of Arusha, Tanzania. Click here or on the collage below to see all the pictures! Elephants, ostrich, wildebeest, zebra, and lions: Ngorongoro has it all! In Asia, riding elephants is a very popular tourist activity however many tourists are simply unaware of the toll elephant rides take on abused and mistreated elephants. Elephant mahouts use barbaric methods of separating and confining juvenile elephants from their mothers in a “pahajaan” ritual which translates to “the crush” or “the breaking ceremony”. A traditional “pahajaan” includes psychological and physical torture using hot iron prods, leg restraints to unbalance and cripple elephants, constant beatings, lighting fires next to restraint boxes, poking out their eyes and other atrocities to forcibly break young elephants’ spirits. Elephants are literally beaten into submission and tortured so that tourists can have the errant pleasure of an elephant ride. This is a horrific ritual that must be condemned and one that tourists should under no circumstances perpetuate. Many organizations (including the Human Society of the US), bloggers and even tour guiding companies are vehemently against the “crush” and actively discourage elephant riding, elephant shows and “mahout training” programs. Instead of taking an elephant ride please consider contributing your valuable tourist dollars to a reputable organization like Elephant Nature Park, which works with Thai authorities and conservation groups around the world to promote the ethical treatment of elephants, provide ethical vocations and support for out-of-work elephants and mahouts, and also provides top-rate tourism and volunteer opportunities. This past April I visited Elephant Nature Park with a high school chum on a visit from the States. We had an absolute blast and to this day it remains a highlight of all my travels(!). I can’t think of anything better than simply getting to be around these magnificent creatures, up close and personal with them as they go about their daily business. 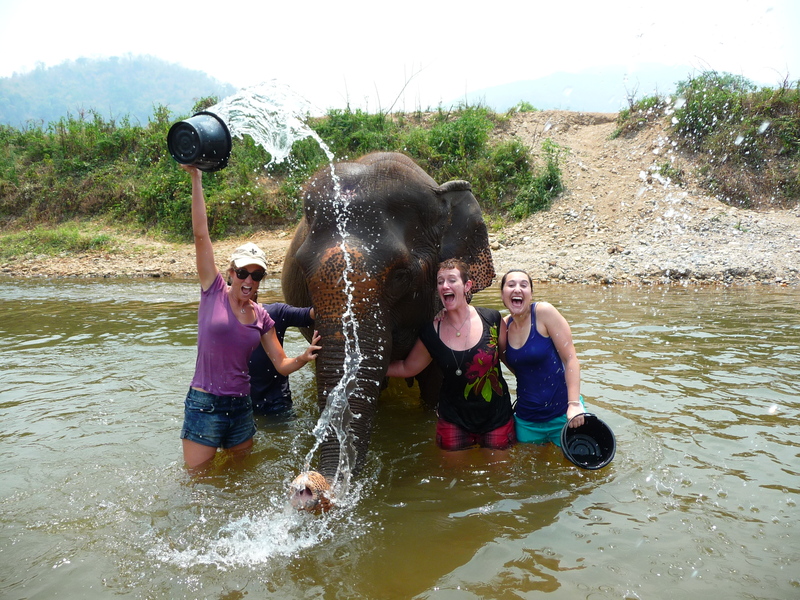 If you’re at all worried that you won’t have enough close contact with the elephants, don’t be: by lunchtime you’ll be covered in elephant snot and dust from feeding the elephants and walking around the park with them, by afternoon you’ll be grateful for a dip in the river where you get to wash and play with the elephants. Then it’s time for more snacks and more cozy time finding shade from the hot sun. For me, the day was absolutely exceptional and a dream come true: I got to cuddle with elephants to my hearts content!!! Links: For more about elephant conservation efforts in Thailand and globally visit Elephant Nature Park outside of Chiang Mai; for a play-by-play description of a day spent at ENP check out this detailed report and videos by blogger Alex in Wanderland. Finally, here’s a quick list of 5 things to consider on World Elephant Day. 3 Laurens & one big happy pachyderm at Elephant Nature Park! No elephant riding necessary. While you’re daydreaming of pachyderm pals, don’t forget to “Like” the new LiveRightTravelFar Facebook page! Categories: Good Cause, Photologue | Permalink.